Here at MamaBreak, we LOVE shoes. And I mean LOVE shoes. I have over 50 pairs of shoes, and love them all. What I love even MORE than a pair of shoes, is a pair of shoes that feel amazing on my feet! I have no arch in my feet at all, so am completely flat footed. I had surgery years ago on my left foot, but it left me with arthritis in that foot, so surgery was never done on the right foot. This means that I experience pain in both my feet for two very different reason. If I am not on my feet a lot, I do not need really comfortable shoes. But when I am out and about with the kids, or having a really busy day at work, I NEED to wear shoes for comfort. That is why I was thrilled to discover Oofos . . . Make Yoo Feel Better . . . and they do! They really do! What I can tell you from personal experience is that the shoes are comfortable for me to wear all day, which I cannot say about any other shoe on the market (and I have tried TONS!). My feet stay pain free and comfortable all day long! 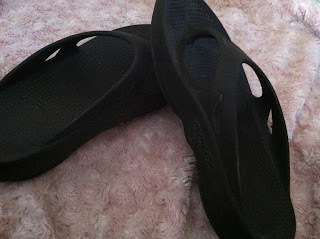 MamaBreak received a pair of Oofos to review here on MamaBreak. MamaBreak did not receive any other kind of compensation. As always our experiences and our opinions are our own. O love, love, love OOFOS! They are the most comfortable shoes ever! I love OOFOS! I have the pink ones and I wear them all the time. I'm hearing a lot of good reviews about this footwear. I love to wear a comfy footwear too! My husband has a pair that he loves! I LOVE Oofos! Thanks for the great review!